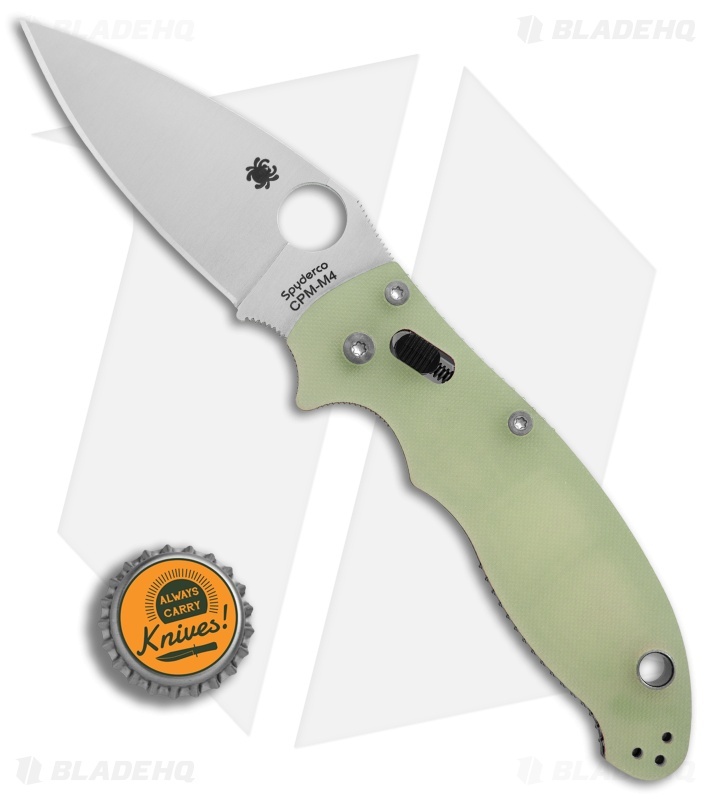 The next Spyderco in line for our BHQ exclusive M4 and natural G-10 treatment is the perennial favorite Manix 2! These are sure to go quick! We've taken the Manix 2 platform and tweaked it slightly to bring you a unique knife that you'll be proud to have in your pocket or display case, while keeping the cost reasonable. The standard S30V steel blade has been upgraded with premium CPM M4 steel, a high-speed steel with fantastic toughness and edge retention qualities. 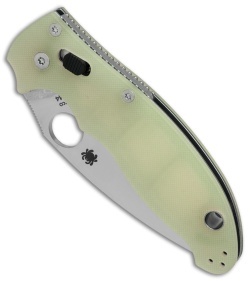 The standard black G10 scales have been changed out for natural G10 scales, which have a unique translucent green color. This Manix 2 also feature stainless steel skeletonized liners, clip and hardware. 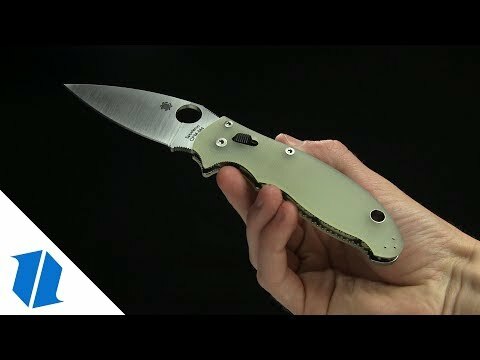 The C101 is an assembly of small seemingly inconsequential features that added together result in one of the strongest knives from Spyderco to date. Outstanding ergonomics are the result of the convenient slide lock, the relationship between the blade’s weight, and the handle's shape. These little things result in the smoothest possible opening/closing and reliable and comfortable cutting. A knife that fits perfectly in your hand! When my nephew needed a solid folder I have him my beloved tenacious. 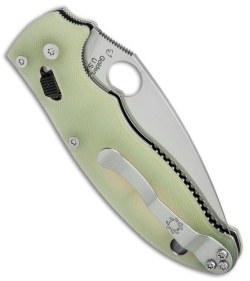 I came across this Manix 2 while looking for a replacement for that tenacious. I really liked my tenacious, but this knife blows that out of the water! The natural jade g10 is gorgeous! The cpm-m4 blade is excellent and sharp as a scapel!! Thanks to blade HQ for making their lineup of jade Spydercos, I want one of each! My wife bought me one of these for my birthday. Love it. Super sharp out of the box, great steel, and the natural g-10 looks really good. Buy one! Pulled the trigger on my first Spyderco and couldn't be happier. Knife came razor sharp out of the box. The action and lock up are spot on. Love the ballbearing lock system. The ergos are excellent no hot spots at all. The blade is a beast of a slicer. I really wanted a Spyderco but there were so many options. In the end I settled for this one and I wasn't disappointed at all. Would definitely recommend this knife to someone looking for a Spyderco. Came razor sharp, the M4 steel is not hard to maintain, it will NOT instantly rust like some people think. Knife owners can be ignorant about how easily a knife will patina or rust. You can easily use this knife for food prep, and any task that requires a knife as long as you wipe down and properly oil it while being stored. This was my first semi expensive knife. It was a great buy, came out the box razor sharp. This knife is perfect. Perfect blade centering, perfect handle edge finish, perfect blade edge angle & sharpening. I am eager to see how well this steel cuts! Fairly smooth opening - needs a little oil and breaking in of the lock. The color of the natural G-10 is better in person - a more natural, sort of white, not the neon green in the website photos. My other EDC is a Manix 2 lightweight w/S110v. I think that I am set! I really like the manix 2. The lock is great because it introduces a new way to open and close your knife. This model is extra special because it has the natural jade g10 and the cpm m4 blade. First, the scales. They are a really cool color and I like how you can see the skeleton liners through it. Now, the blade. It came really sharp out of the box and the blade has a really cool leaf shape. The opening hole is extra large. Also, The lanyard hole is really accommodating for any para cord or rope. Overall a really cool spin on a classic knife. I love the Manix, the pocket clip is positioned perfect without creating any hot spots, and handle has a well rounded back end to allow for low pocket intrusion. This version is fantastic for many reasons. Unfortunately they don't have a Manix 2 M4 in production because this is stellar! This model has the skeletonized steel liners, G-10, CPM M4, and the robust ball-bearing lock. If you have never handled a Manix, some feel it sits quite large in the pocket, and while it does I feel the PM2 sits much more awkward, making the Manix 2 much more comfortable. Additionally, I feel the caged ball-bearing lock is not as slick as the Axis lock, but feels smoother upon opening. Just be aware, you may annihilate your thumb while the lock is still wearing in, because boy is it stiff. What really sets this above, is CPM M4. If you have never tried M4, I seriously suggest it. Way more practical than many other pocket knife steels, if and only if, you are okay with a patina. M4 won't chip out easily like other common steels, but holds an edge for a very long time. 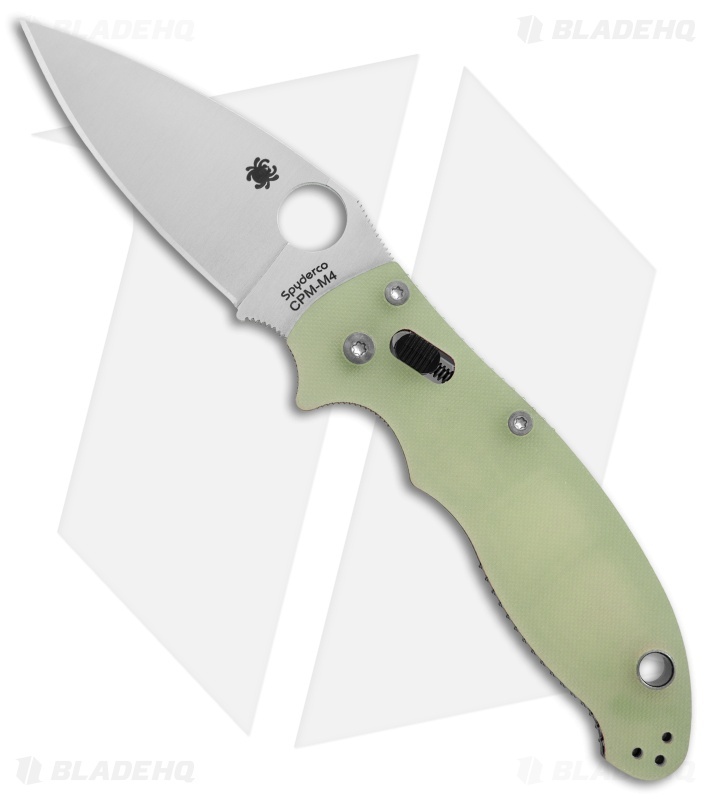 I REALLY wish Spyderco would make a production Manix in M4, because its robust nature would make it an ideal candidate for it. I’m sure it will continue to rise in value, but I can’t keep it locked up in a drawer; it’s just too good as an EDC. Experienced M4 steel for the first time on my GB2 and instantly fell in love. Super sharp, great edge retention, excellent toughness, just not stain resistant. As long as it’s cared for properly, the lack of corrosion resistance isn’t a problem. The performance benefits far outweigh the risk of staining. This is my first manix and I absolutely love it. The ghost green scales are pretty special, too. Will probably end up getting the DLC coated version when it’s released. I grabbed one of these as soon as I I got the email notifying me that they had dropped. I love the shape of the Manix 2. Great form and ergonomics and the CBBL is wonderful. This version with the skeletonized liners, translucent jade G-10 and M4 steel feels like one of the best variations of the Manix 2 to be released. The fit and finish are superb, and it is visually stunning. It is probably the prettiest knife I own, and one of the sharpest out of the box that I’ve ever owned. The nature of the steel makes the stellar gimping on the Manix even better, it is pretty sharp and grabs your hand with gusto. The only downside of this knife is the nature of M4. As a Hawaii resident the steel started to get a patina with tiny rust spots after only a few weeks (I was being very careful and maintaining properly. I was cognizant of the possibly from day 1), so I had to force a patina on it and slather the blade in heavy oil to keep it from getting more rust spots. It’s this, and only this, that keeps it out of my pocket. For people living in drier climates, good luck keeping this out of your pocket. Great exclusive, just not the smoothest. I have never had a manix before and compared to the paramil i just bought it was really tight and stiff. Working on it over time the action has smoothed out that being said its not the smoothest knife however it is getting better. The action aside the thing is built like a tank, extremely solid. Without doubt the strongest folder I own, and I own a couple. M4 is a great steel for every day carry and the Manix 2 is a balanced choice for edc, so the combination is perfect. My knife I received from BladeHQ was flawless. The knife came shaving sharp with no noticeable burr. I am absolutely thrilled with the quality of this model. Only knife I’ve carried since I got it! Got this for Christmas from the wife with a little hints thrown in here and there. This one gets compliments from everyone who’s seen and handled it. I have to say it’s the only knife I've carried since I got it. Beautiful handle scales and the steel is awesome haven’t even sharpened it yet and still razor sharp. Eventually It’ll go back into rotation in my edc but for now I’m lovin it! So glad I bought one before they sold out. This IMO is the best version of the manic and a great knife. I previously had a Manix 2 in S30V, which was stolen out of my car. Bought this one in CPM-M4 as a replacement. Always loved the ergonomics of this series. Just feels right in my big hands. Not too bulky, and more than enough blade length for my typical everyday needs. Now I can’t wait for this knofe in DLC finish!!! For sure going to pick one up when it’s available! Use it as my EDC everyday, superior steel over S30V and skeletonised liners make it perfect should have bought another when i had the chance! This knife is a little too big to carry around in my khakis, but it’s my go to anytime I need to do some serious work. Feels perfect in your hand and looks great. Love the G10 scales. Buy this knife as soon as it’s in stock. I really like the blade, but.. I'm not a big fan of the lock, unbelievably stiff. Manix 2 is a beefy knife for beefy work tasks! When you add M4, you can survive an apocalypse with this! Mike Connors would be proud! I stopped carrying my Protech Runt to carry this Manix 2 M4. It carries well in the jeans front pocket and it's the toughest blade I own by far. It holds an edge like no other. IMHO, the Manix 2 is a little too big to pull out in public or at work. The Runt was never a problem, so I have to choose my moments to use this blade to not scare anyone. Still, it's a great knife and is a blast to flick open. Lock up is 100% tight as is the pivot. Fit and finish is better than blades that cost twice as much. Clip isn't too tight so it won't tear or wear your pocket. If you have arthritus in the hand, the blade lock may be tough to actuate. My first Manix 2. This knife is genius. It's hugly as hell and in the same time incredibly awsome. Top ergo, perfect fit and finish, and the blade... well perfet, not too thin not to broad just the perfect amount of steel to cut anything. I'am amazed by the M4, hold the edge like nothing I'have ever seen. Big con : M4 stains and marks... A LOT. I use my knives so I don't really care but a pure collector should really be aware of that fact. First spydie and I love it. The lock breaks in quickly and is now very easy to use. The M4 keeps cutting without the slightest sign of dulling. Natural G10 is just about the coolest. Plus it’s made on Earth. Who’s not down with that? I have been carrying this knife almost exclusively for about 2 months now and it has been awesome! The M4 steel is scary sharp and the factory edge still has tons of life left after cutting cardboard, food, plastic and quite a few harder tasks. Best EDC knife I own! Highly recommend! This is the first spyderco that I have added to my collection of knives. The pictures do not do this knife justice! The natural G10 scales feel great in hand, the blade is razor sharp out of the box. This is undoubtedly my new favorite knife. Do not hesitate to buy this knife! This is an absolute steal at its price. With the M4 blade steel, natural G10 (very grippy, might be a pocket shredder), and the ball bearing lock, this is a must-buy! You cannot beat it for this price! At first, the ball-bearing closing wasn't entirely smooth, but once you break it in, you have the smoothest closing you could imagine! I've heard that the Manix 2 takes up a lot of pocket space, and I agree, it does. But that personally doesn't bother me. Sure, it isn't as good as the Benchmade 940 as an EDC knife, but as far as I'm concerned, this knife is better overall. Anyways, bottom line is that you should get this blade. Stop wasting your time reading the reviews, buy it. Why are you staring? Buy it! The ball bearing lock is freaking awesome. It's like Mr. Benchmade walked over and nudged an elbow into the ribs of his buddy Mr. Spyderco and said hey try what I'm doing only do it like this... the all of a sudden the Manix 2 appears. I can't put it down. Came perfectly adjusted right out of the box the blade just falls when you disengage the lock up. All around great knife I won't trade it for anything. I couldn't pass this up. Had to buy two. This blade will be gone before you know it. 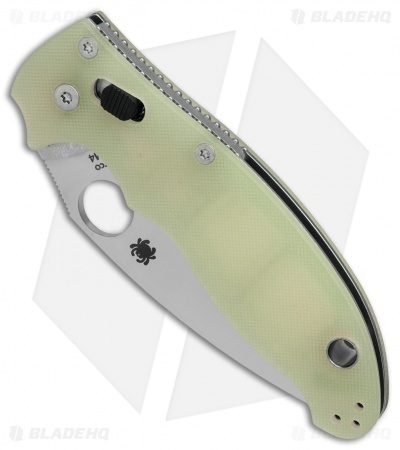 Manix 2 in GHOST GREEN with awesome skeletonized inserts. Super quality. Super fast. Premium steel. Amazing looks. Great grip. Fits well in the hand. Awesome jimping. You won't get the same thing by just changing out the scales on a regular manix. These are factory cut scales and it's saving you $60-$80 bucks on a second pair of scales. This knife gone soon. I should have bought 5! This is my first Manix 2 in my long line of other Spyderco's, and man, what a beautiful knife! This is also my first Natural G10 scale knife and I'm way more impressed with the "in person" look of the G10 than what it looks like in photos. I feel as though at this price point, you're getting a feature rich knife and that's why I snagged it. Not disappointed whatsoever. I've owned the lightweight manix 2, and I was not happy with the opening and closing of the knife. It was too light and the blade would always bounce back open while closing. This knife, out of the box, was smooth as hell. Great steel, nice looking handle. G10 is real grippy might be a pocket shredder. This knife is simply amazing. All USA made with M4 steel for $135! It can't be beat. It has what is probably the most ergonomic handle of any folding knife I've handled. Its super smooth and the m4 blade was dead center and razor sharp out of the box. This is the only production knife in my collection/rotation as I've only collected customs this past year. Definitely a must have! Would make a great gift or addition to any knife addict's collection! I have always loved my S30V Manix 2 but the M4 and Natural G10 is awesome. Spyderco has taken what I considered a perfect knife and made it better. It's a steal at this price! This is a great knife and a lot of knife for the money! I prefer flippers and more of a spear point so I'm not even sure why I bought it but I'm glad I did, I really really like this knife! It just feels like a solid well built knife when you hold it and the fit and finish is very good. Also the handles looks a lot better in person than in pictures, looking at it online I thought they looked kind of cheep but I watched a review on YouTube and they said they we much better looking in person and they definitely do. To anybody that remotely like the Spyderco style knives I would highly recommend this one! It's a little too big and scary for my office mates, but since it arrived last Friday, I carry my M4 natural G10 Manix everywhere else. At this price, it's an amazing value, especially for a limited run exclusive. Some people will want to put them in a safe as a collectible. And it's certainly a good investment that will soon be worth more than you paid for it if you do that. I, however, plan on carrying mine as much as possible. This is my second Spyderco... the first being Para 2 and this Manix is my favorite. My knife showed up flawless and razor sharp! I love the look of the natural G10 scales. It's somewhat translucent showing the inner frame. The blade release button is very comfortable to use as it's in the perfect spot for my thumb and index finger to use. The handle fits very well in the hand and the gimping is plenty! This is a steal for the price! Blade quality, build quality, and smooth action. If you're on the fence... GET IT!! !